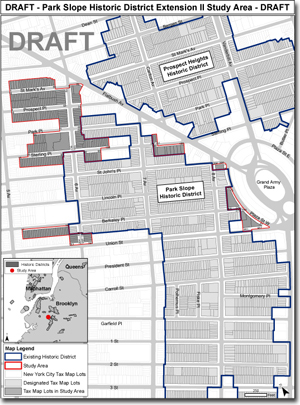 The first expansion of the Park Slope Historic District in almost four decades took place in April 2012, when the New York City Landmarks Preservation Commission (LPC) designated about 600 buildings in the South Slope between Seventh and Fifteenth Streets and largely between Seventh and Eighth Avenues (see map at right). Those structures will join the 1,800 buildings within the original historic district established in July 1973, when Park Slope became one of the earliest such zones in New York City. The historic district played a strong role in Park Slope’s renaissance in the 1970s and 1980s. Our objective in the expansion of the district is to preserve our neighborhood’s special character. advocates with the community, elected officials, and other stakeholders for the need to preserve Park Slope’s architectural and historic character. drives the designation process forward through our persistent follow-up with the LPC and other government agencies. We have seen a great deal of progress in achieving our committee’s goal. With the South Slope expansion area in the April designation. The action was later ratified by the City Planning Commission and the City Council. The successful completion of the first expansion of the historic district in 39 years has set the stage to move forward with Phase 2. This expansion is situated in the North Slope, the area between Union Street and Flatbush Avenue and above Fifth Avenue. At a meeting with the LPC in December 2012, representatives of the Historic District Committee presented further research and petitions signed by North Slope homeowners to press our case to enlarge the boundaries of this expansion beyond what was presented to the committee earlier in the year. As a result, the LPC resurveyed the area and agreed to a modest increase in the boundaries it will formally present to the community. The proposed North Slope expansion; click on the map to download a larger view. A meeting with property owners within that area took place in early March 2013; LPC staff provided information and answer questions from those in attendance. At right is a map of the proposed expansion area. This meeting will be the forerunner of a formal public hearing, expected to take place in the latter half of 2012, for the purpose of gathering testimony from property owners, community organizations, and preservation advocates. Given the high level of support within the area for inclusion within the historic district, we expect the LPC will move forward with writing the necessary designation report and vote on it in 2014. The Historic District Committee has had discussions with the LPC about subsequent expansion phases. Phases 3 and 4 will focus on the Center Slope, and will consider another 1,000 buildings in the area between Union and Ninth Streets and extending above Fifth Avenue to the east side of Seventh Avenue. The Historic District Committee welcomes people who would like to help achieve the goal of expanding the historic district. Even with the South Slope’s designation, only one-third of the neighborhood will be protected from demolition or inappropriate alteration. The committee envisions four or five more expansion phases over the coming decade. Anyone interested in joining our efforts can e-mail the committee at historic.district@parkslopecivicouncil.org.